Have I mentioned my love for Thanksgiving foods enough recently? It’s true. I adore the traditional flavors of the holidays. And while I do enjoy a Thanksgiving turkey, I know that many of my friends and family prefer vegetarian dishes, and so I love finding lots of options that everyone can enjoy – the vegetarians and the meat-lovers alike. 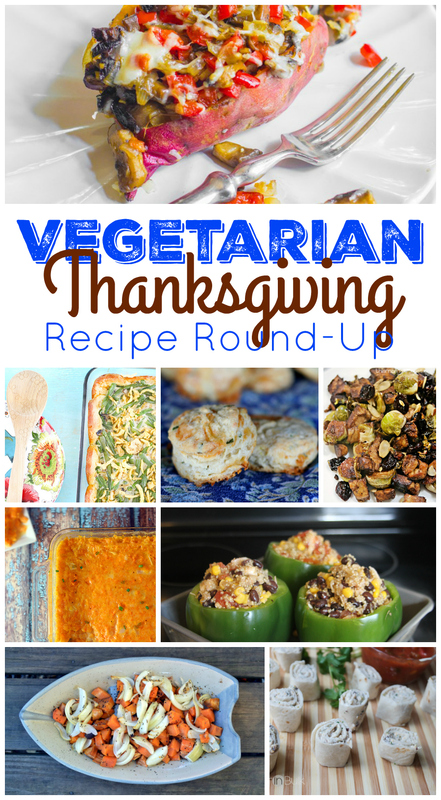 Here is just a sampling of the meatless recipes that stood out to me in last week’s Vegetarian Thanksgiving Recipes Fresh Flavors Swap linky party (check out that link for even more vegetarian dishes to try!). There are so many amazing meat-free choices out there…so even when we are serving the holiday bird, I like to serve up plenty of meatless options to round out the Thanksgiving table. And don’t forget the Fresh Flavors Swap hosts’ new recipes for this week’s theme…I cooked up some delicious make-ahead mashed potatoes (time-saving AND yummy!) and Laura at Celebrate Woman Today made some Nutty Squares that sound simply amazing! What are your favorite vegetarian dishes to serve during the holidays? Note: Unfortunately, this is my last Fresh Flavors Swap post. Yes, it was a short run, but I decided that it was not good timing for me to undertake a project like this. I will still be bringing lots of recipes and round ups, so don’t fear….there’s plenty of deliciousness in store. Just not the Fresh Flavors Swap. Thank you to everyone who linked up and shared and partied with me! I eat a lot of vegetarian meals, but I am not vegetarian. I am going to try some of these recipes and make some of them for this Thanksgiving. So healthy eating vegetarian. these sound delicious. i get this mama loves and her recipes are great as well. i am a big fan of broccoli salads and love squash and sweet pototoes, usually i make them plain b/c i give them to my dogs as well and we share. so i have to be careful abt what ingredients i add. What an amazing assortment of meat less foods. They all look so enticing to me. I have cut down on my meat intake so much. I am hoping to be a vegetarian soon! Oh, my goodness… everything here sounds SO DELICIOUS! I’m a vegetarian, my boyfriend is vegan(ish, lol) and I’m always trying to come up with good, hearty options for dinner (aside from the usual stir fry). Thank you so much for sharing this! I’m so glad everything looks good! Some of these vegetarian dishes aren’t vegan, but I know form experience that sometimes all you need is an idea to spark more ideas. I bet he could modify several of these dishes to be vegan-friendly, too!